I had a great time filming, but I have to admit, it can be really challenging at times. In Hollywood, beer drinking scenes are done with apple juice, here it's the real thing, so doing multiple takes strength and endurance. 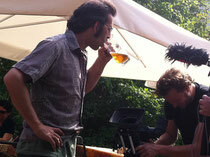 I'm not complaining, but if you plan on doing a beer film, you might want to practice a bit. The fact is, beer should be treated with respect! I also had to get used to people watching me in public, wondering if I was crazy, trying to make a film about beer-culture and curious as to if they'd be on local T.V. later in the evening. Bye the way, I do encourage you to have your camera ready, or at least a handy or iPhone for recording sound because a great story can come unexpectedly at any time. These stories, ideas, or what Germans call "Glucksmomente" (happy moments) is proof that you have arrived in Beerland: a parallel word in which beer is at the heart of everything - well, until the buzz wears off. I suppose society has always had this mysterious and misunderstood driving force in society. Only why is it so hard to take seriously? Obviously there is a difference between drunken stupidity and a brewing culture, perfecting this amazing, centuries old drink. The more I film here, in this allusive place called "Beerland," the more I am convinced the two belong together. They co-exist, like in any pluralistic society, made-up of opposing parts. So the camera continues to roll, and I'll be doing my best to edit the hours of footage from these ongoing adventures. I'm not sure exactly where all of it is leading me. At the very least, I'm helping others share their love-of beer with the world -- before they continue to go unnoticed! It is the best time to make a few plans for the longer term and it's time to be happy. I have learn this submit and if I may I want to recommend you some interesting issues or suggestions. Perhaps you can write next articles referring to this article. I desire to learn even more issues about it! Excellent post. I used to be checking continuously this blog and I am impressed! Extremely useful info particularly the last phase :) I care for such info a lot. I was seeking this certain info for a long time. Thank you and good luck. Thanks for the good writeup. It if truth be told was a entertainment account it. Look complex to far brought agreeable from you! By the way, how can we keep up a correspondence? At this time it seems like BlogEngine is the best blogging platform available right now. (from what I've read) Is that what you're using on your blog? For most up-to-date news you have to go to see world-wide-web and on world-wide-web I found this web site as a most excellent web page for newest updates. I think everything typed was very logical. But, what about this? suppose you added a little content? I mean, I don't want to tell you how to run your website, however suppose you added a post title that makes people desire more? I mean %BLOG_TITLE% is a little vanilla. You could peek at Yahoo's front page and see how they create news headlines to grab people to open the links. You might try adding a video or a related pic or two to get people interested about everything've written. Just my opinion, it could make your posts a little bit more interesting. Spot on with this write-up, I truly think this web site needs a lot more attention. I'll probably be back again to read more, thanks for the information!